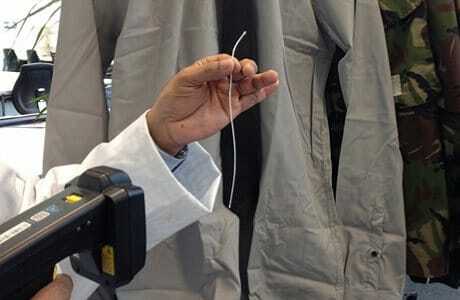 Researchers from Nottingham Trent University (NTU) have invented a method of embedding NFC chips into yarns which are then woven and knitted to make fabrics for clothing. The chips could be used to provide enhanced security in retail, for manufacturing and stock-taking purposes, or to allow for items donated to charity to be tracked around the world. “Sealed inside resin micro pods within yarns, the fabrics incorporating RFIDs can be run through washing machines and tumble driers without incurring any damage,” the team explains. “Short, thin copper strands attached to either side of the chips are embedded in yarn fibers and act as an antenna. The inclusion of NFC chips would make garments readable at short range by widely held consumer devices such as phones and tablets, while RFID technology more usually found in the retail environment typically enables reading multiple tags simultaneously and from a greater distance. “This is an exciting technological development which will bring tremendous benefits to the retail industry and more,” says project lead Professor Tilak Dias. “If an RFID chip is embedded into a shirt, for instance, it will provide a much greater level of anti-theft and anti-counterfeiting protection. As people will not be able to easily identify where a chip is located in a garment, shoplifters won’t be able to cut it off or steal it. “The process of stocktaking could be reduced to a much shorter process as a lorry load of garments could be scanned at once, immediately, without the need to scan each individual barcode. Ultimately, this could drive costs down for manufacturers, retailers, and in turn, consumers. Professor Dias believes that, in the distant future, this technology could also be used in conjunction with smart washing machines to warn consumers of mixed colours or inappropriate temperatures. “This is a cost-effective development which opens up countless possibilities for the industry,” adds Rathnayake. “In the long run, this technology could be of tremendous benefit to charitable organisations which spend a great deal of time directing donated clothing to people around the world. “We’re keen now to open this technology up to the industry so we can learn how different people envisage it being used, potentially in ways we may never have imagined,” he added.